Lesley J. Wood is Professor of Sociology at York University in Toronto, Canada. She is the author of Crisis and Control: The Militarization of Protest Policing (2014) and Direct Action, Deliberation and Diffusion (2012) and co-author of the third edition of Social Movements 1768-2012. She is an activist in the global justice and anti-poverty movements. Granadas aturdidoras y Robocops: ¿Cómo podemos confiar en que la policía proteja nuestras protestas? 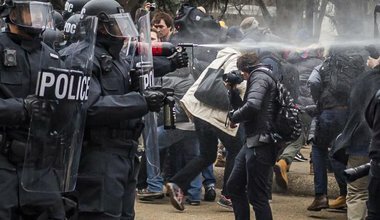 Rubber ball grenades and Robocops: can we trust the police to protect our protests? What is the logic behind increasingly militarised protest policing? What are the costs of this strategy? And in what ways is resistance to aggressive policing growing?